The Huston Park Wilderness in the Medicine Bow National Forest contains 30,588 acres of forested land at high elevations. 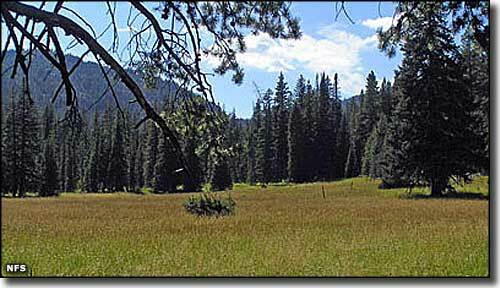 The stands of aspen, lodgepole pine, fir and spruce are intermixed with open parks, brushy meadows and alpine bogs. 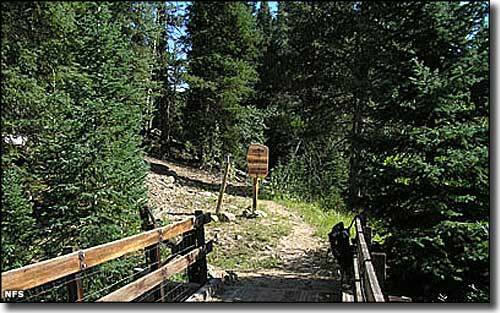 Huston Park straddles the Continental Divide and contains 45.9 miles of the Continental Divide National Scenic Trail. This section of the CDNST is marked by blazed trees and rock cairns, meaning it's essentially an undeveloped section of the trail. While a lot of Huston Park is above 10,500', the average elevation of the CDNST here is 9,750'. At no point on the property can you get above treeline. There aren't many lakes and the streams tend to be small, although some streams are large enough to support good populations of trout. The streams all drain to the North Platte and Little Snake Rivers. There are a few trails in the Wilderness but everything is undeveloped to the point that there aren't even well-marked trailheads. The only time there are more than a few people in these woods is during the fall hunting season. Photos courtesy of the National Forest Service. Map courtesy of National Geographic Topo!